Here in Montgomery County in recent years there have been rule changes allowing us to put more kinds of plastic containers in our recycling bins. However, whole categories are still forbidden, and those end up in the trash. The best solution for the eco-conscious consumer is not to buy products that come in those containers in the first place, but sometimes it just happens. When I end up with one of those non-recyclable containers, I often try to think of a repurposed use for it, so at the least it spends longer out of the trash, and maybe replaces some other plastic thing I would otherwise buy. And of course the first use I think of is seed-starting. 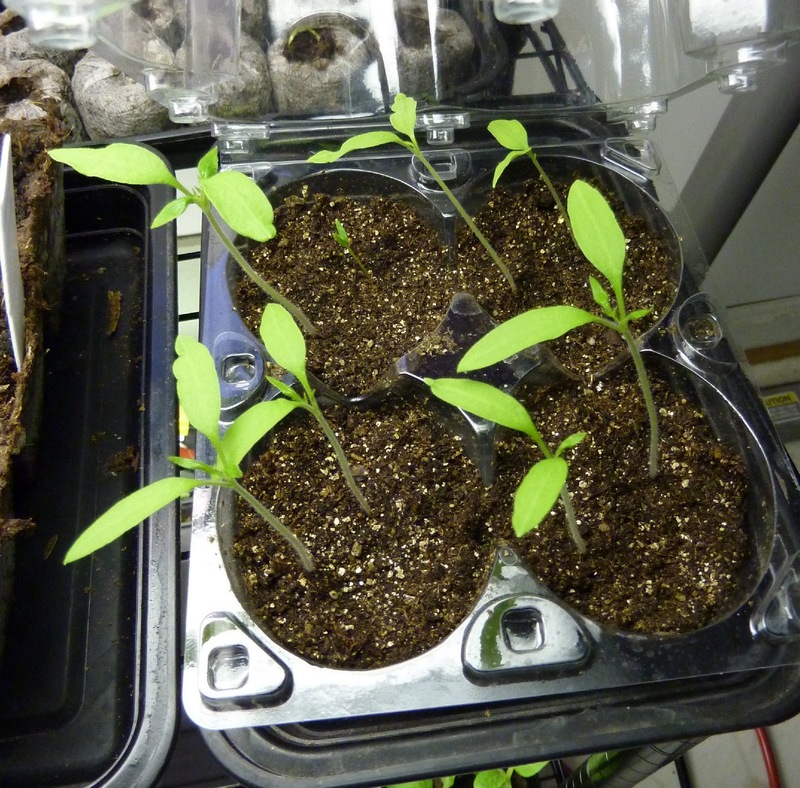 These tomato seedlings are growing in a container that once held mangos. It already had holes in it, so I put it inside one of the black trays our Chinese takeout comes in. I used to reuse yogurt cups, either with holes punched in as seedling pots, or cut into strips as plant labels, but now we can recycle those so usually they go in the bin. Now I cut strips from styrofoam trays to make labels out of. Here’s another tomato growing in the thing a farmer’s market vendor used to hold her cupcakes. 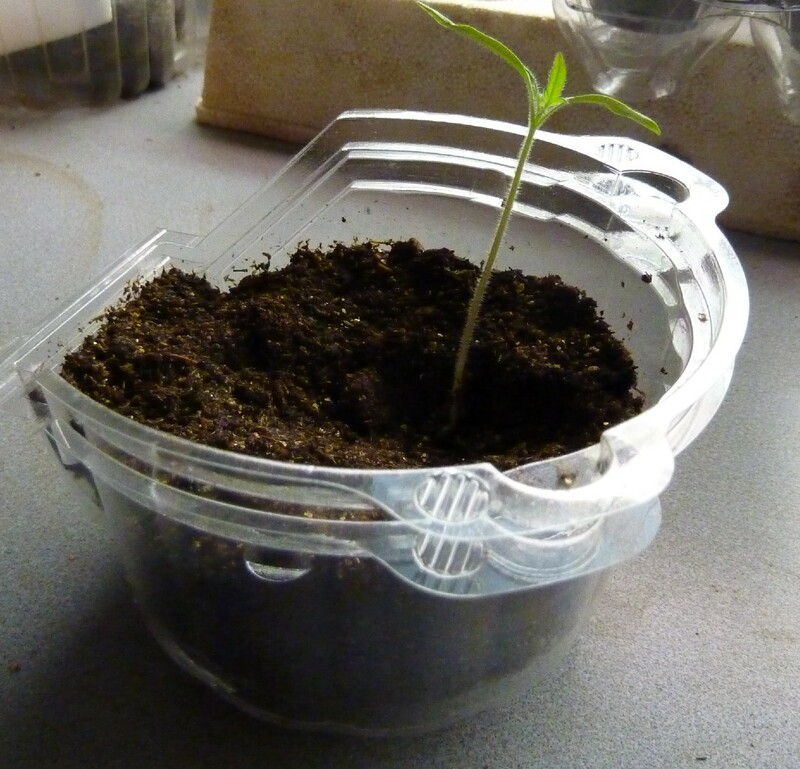 It has a lid that snaps on and is good for keeping the soil moist during germination. A lot of the containers I save have lids. I admit that my system doesn’t look tidy and uniform, but actually I like all my mini-trays and one-at-a-time starting pots, because I’m often starting just a few of one sort of plant, not a whole traditional seedling tray full. What containers have you kept out of the landfill by reusing them, and for what purpose? 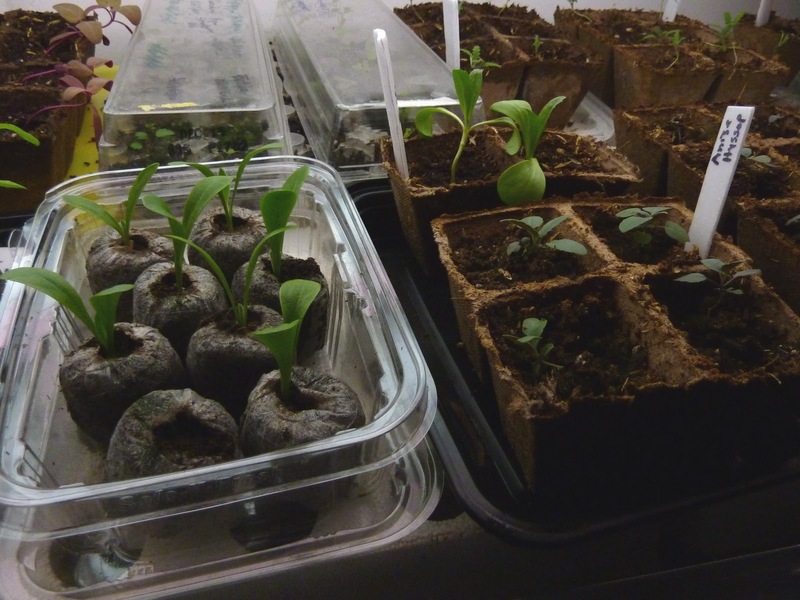 i use the plastic and styrofoam egg cartons for seed starting in the winter. in the hot summer months i also use the paper pulp ones (but they evaporate and lower the soil temp, so not in the winter). I use egg cartons too – they're great. The seasonal distinction makes sense – thanks for the hint!